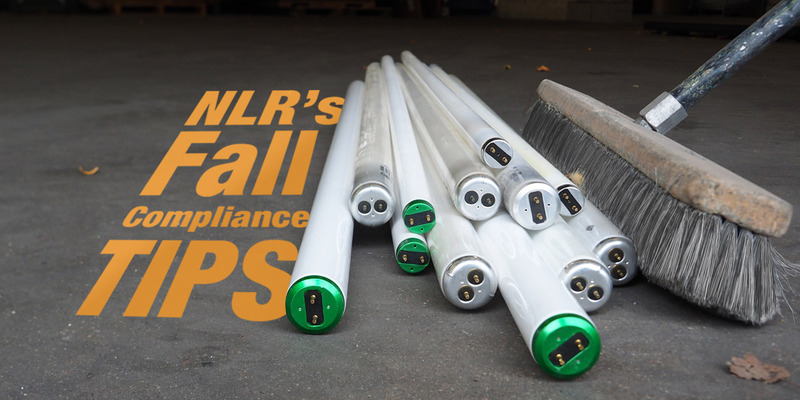 Compliance Tips: Fall 2018 – NLR, Inc.
Fall is here and that means it’s time to get organized, so you’re not overloaded by universal waste this winter. We asked our in-house experts some ways to stay in compliance and keep your waste organized. Our customer service specialists had a good deal to say about lamps, ballasts, and how to stay in compliance. Their first advice is that you should have plenty of containers on hand to store your lamps and lighting ballasts properly. Lamps (light bulbs) must be kept in closed containers while you accumulate them. Fiber drums and manufacturer’s boxes can be used to keep linear bulbs stored in a relatively small space and also keeps them from being broken. Lighting ballasts are also regulated in certain states. For lamps, when a bulb is broken it becomes hazardous waste (in certain states) and needs to be cleaned up in accordance with laws and regulations. It is far easier to make sure your lamps and ballasts are stored properly in the first place. Second, is to separate lamps and ballasts from fixtures, as they are universal waste. Their housing fixtures are usually scrap metal and those elements should be separated because they will be bound for separate destinations. We unfortunately do not handle fixtures. When speaking with our waste handling personnel, one of the largest potential issues they see with maintaining a clean compliant warehouse is battery storage. Larger batteries not only take up space, but often have liquid cells and need to be stored upright, so they don’t leak or create spills in your facility, in-transit, or at a destination facility like ours. Smaller batteries often pile up quickly and can create their own hazards, for instance short circuits between mixed chemistries occur more often than people realize. The best advice our personnel offer is to sort batteries by type. Keep alkaline batteries together (alkaline batteries on their own do not have to be taped) and tape your lithium button batteries and the terminals of everything else (lithiums, nicads, wet batteries, etc). Make sure there are no wires connected to terminals and if those can’t be removed tape those as well. Set aside a pallet to prep larger batteries. As you accumulate them make sure they are right side up and terminals are taped to prevent short circuits. Proper handling and organization can cut down on toxic spills and short circuits that can cause fires. See our wet battery procedure for more info. E-Waste is problematic because of its sheer size and volume. Monitors, printers, computer parts, and accessories, all add up quickly. One way our warehouse deals with it efficiently is to place these large items into different gaylords, for sorting by type. Monitors are collected in one gaylord, printers in another, computer accessories in another, and so on and so on, but not everyone has this type of space for E-Waste. So they suggest utilizing services like scheduling recurring pick-ups to make sure your E-Waste is sent out at a regular interval. Also, you can separate out certain E-Waste items that need special attention, such as ink and toner which can easily spill, or hard drives that should be handled in their own secure manner. We provide special services for ink and toner and hard drive destruction as well. Looking for more ways to better manage your universal waste? Request a quote or call 877-822-4733 to get started recycling with NLR. We can help devise the recycling program right for you.